The Mission of Today's Church is a compelling collection of twelve essays from current Baptist leaders addressing three major questions: (1) What does it mean to be a Christian today on individual, group, and societal levels? (2) How can Southern Baptists best work together? and (3) What is next for the Southern Baptist denomination? 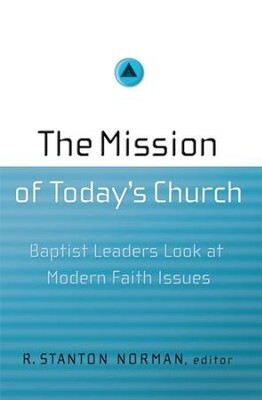 The Mission of Today’s Church is a compelling collection of twelve essays from current Baptist leaders addressing three major questions: (1) What does it mean to be a Christian today on individual, group, and societal levels? (2) How can Southern Baptists best work together? and (3) What is next for the Southern Baptist denomination? Those addressing these key topics in-depth include Stan Norman (“Together We Grow: Congregational Polity as a Form of Corporate Sanctification”), Ed Stetzer (“The Missional Nature of the Church”), and Daniel Akin (“Ten Mandates for Southern Baptists”). Among the many other contributors are Chad Brand, Charles Kelley, and Jim Richards. Stan Norman serves as associate professor of Theology and occupies the Cooperative Program chair for Southen Baptist Convention Studies at the New Orleans Baptist Theological Seminary. He is also the creator and director for the Baptist Center for Theology and Ministry. In addition to his teaching, speaking, and writing ministries, Norman has served as interim pastor for numerous churches in Texas, Louisiana, Mississippi, and Alabama. He and his family reside in Madisonville, Louisiana. I'm the author/artist and I want to review The Mission of Today's Church: Baptist Leaders Look at Modern Faith Issues - eBook.